Hours for swimming pool and jacuzzi (10h to 13h and 17h to 20h). Guests children are our luck .. for them we have children playground kids houses, cars, bikes, trampoline etc ... The house is only 200 meters from the city center. In the city center there is a market, shop, bakery, post office, exchange office, cafes, pastry shops, discos, etc. A gym is only 20m away. You can take a walk on the beach (only 200 meters away) where all kinds of fun are for young and old. But you can just enjoy the peace in the shade of the pine trees. Only 400 meters away you can find a few beautiful beaches and secluded coves. Nudist beaches are 800m away. The hosts will help you to find the best selection of local restaurants, where there is authentic Mediterranean cuisine, but also where you can get discount for boats, motor, etc. They also offer transport from the airport to the apartment. We are always available for everything you are interested in. Welcome to Vilaveja - team: Vesna, Tiho, Tim and little Adrian. It was a very pleasant stay, great location and very helpful host! We have spent great time. 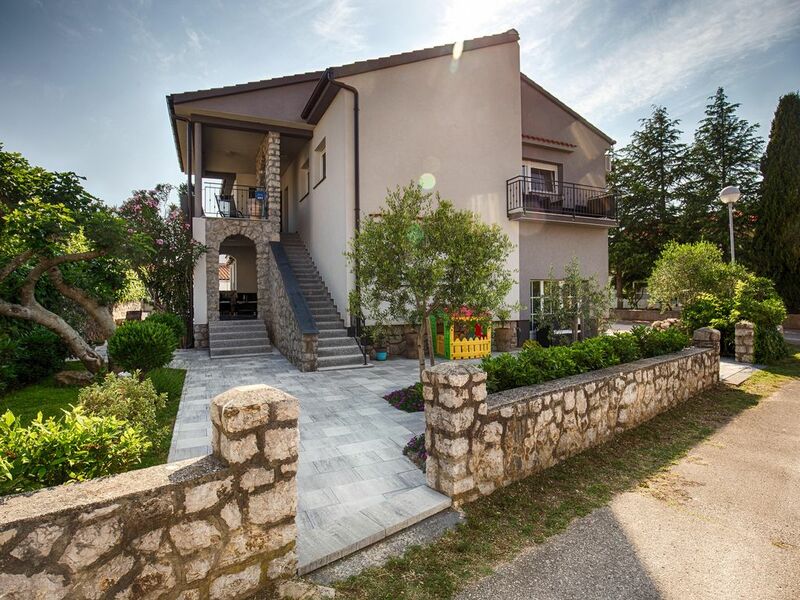 The entire house is renovated in a beautiful modern style and all equipment is completely new. Each room is absolutely clean with all needed equipment. We appreciated good access to the various nice beaches as well as to the city center. Within this time we could reach the supermarket, post office, bank, bus station and lots of small cute shops. The house owner was extremely friendly, helpful and gave us many advice what to see at the city KRK as well as island KRK. Sehr sauber und angenehm. Absolute Hilfsbereitschaft der Vermieter. Sehr schöne Gegend. In der Nähe zum Strand.